Stunning Keisha: Fancy Feast Sale? SCORE! I'm dreaming of a cabinet full of FF Chopped Grill! Pop sez Pathmark is running a big sale on Fancy Feast this week. Twenty cans for $11. On top of that, they have a dollar coupon which brings it down to 20 for $10! SCORE! Since the price has been 83 cents a can, the cheapskate frugal peeps haven't bought any and my cabinet was getting mighty empty. I have instructed them to stock up for the year!!! You can take all the money you're saving and donate it to your favorite cat charity like A Call 4 Paws or Blind Cat Rescue! Of course, you can use it to send me toys or treats also. Oh, I have a new fave! I still love the grilled tuna but I also love the Chopped Grill too now which is strange cos I've never liked paté. 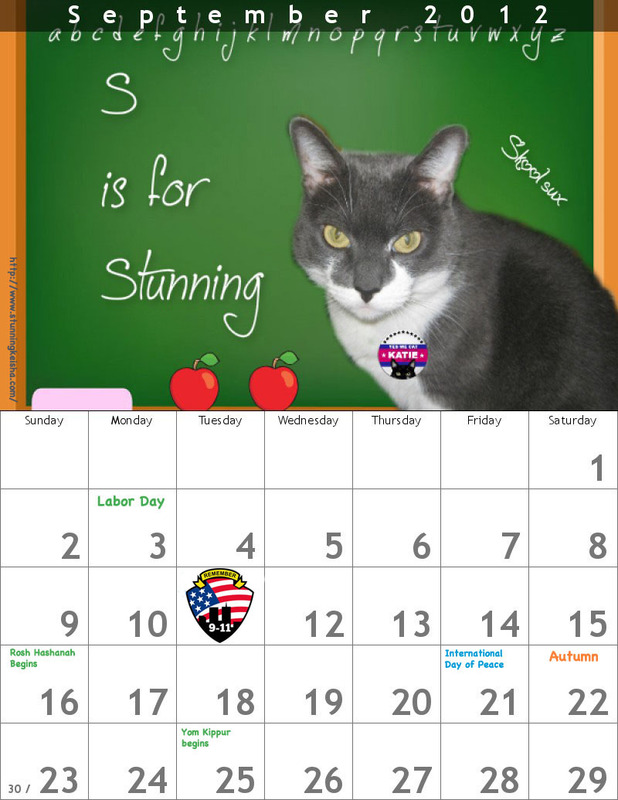 You've all been waiting for me to unveil my September calendar and here is it! Yes, it's already September. Summer is almost over and the little humans will be going back to school. Heh heh! Peace and quiet at last. Guess what? TW forgot Senile Saturday yet again. Perfessor CK will have to fail her big-time. Pop is talking crazy about killing TW Senile Saturday cos no one seems to like her it. I hope he's wrong. Liking the calendar Keisha. Have a fantastic Friday. You would make any calender look super good, CK. I haven't liked trying to eat the pate type dinners. I like pieces that I can easily get up into my mouth. I don't know what it is with this family of kitties since there has been a litty living here. NONE of us ever liked the extra labor of getting the pate foods in and down. I guess it would never occur to us to just bite it up into our mouths. I like the sliced hearts and Liver feasts. Thanks for giving me and our sweet Blind Cat Rescue kitties a shout out. Try not to eat the FF all in one sitting. Hey, don't kill of Senile Saturday, just the fact that we can never remember shows it is a success! Amen to the 9/11 date fur sure, such a sad day. Hey, a sale on food is really good news though! Fancy Feast Sale! Me will has to send Mommy to Spokane!!! ps can you pass me some Fancy Feast? ooooh, we LOVE that FF!!! Of course Mommy says it's too 'spensive cos we are PIGGY PIG PIG PIGS. YAY for sale on Fancy Feast ! YAY for your september calendar ! YAY for senile saturday and YAY for Katie and Blind Cat Rescue ! My human pays like twice as much for my food! She does not complain, though, she just eats less. Jeez, we never get Fancy Feast. We can see we're really missing out! Sassy here - for me, I do not care about flavor, but am all about the gravy. The more gravy the beter. The Spotted Airhead on the other hand, does not even like wet food! Pate is my FAVORITE! Mmmmmmmm. So you will enjoy my post for Caturday. Tell your Woman we like Senile Saturday, but of course it's hard to compete with CK. Almost anyone else is going to seem like 2nd-best. Still, it would be nice of you to let her do it once in awhile. My Human was thinking of seizing control of a Catruday soon. I dunno though--I don't think I'm in much of a mood to "share" with her. You know what I mean?